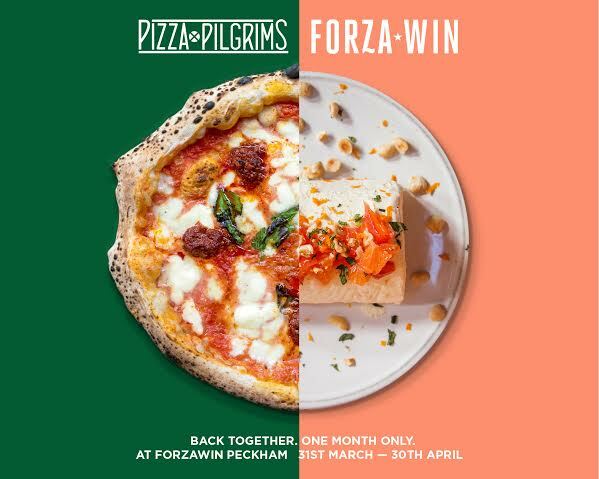 Back in 2012 Forza Win started as a rooftop pizza pop-up with the Pizza Pilgrims - see my original post here. 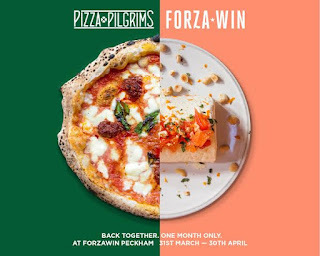 Four years on both are going from strength to strength, and to celebrate the anniversary they're 'getting the band back together' for one month of pizzas (+ starters and desserts) at Forza Win in Peckham. Expect delicious antipasti, fantastic pizzas with fine toppings, and awesome desserts. It's open from 31st March to 30th April, Thursday to Sunday, with two evening sittings (2 lunch sittings on Sunday). Can't wait! "Remember when we first started this thing? It was Bash (Forza Win) James (Pizza Pilgrim) and Thom (other Pizza Pilgrim) and Archie (Forza Win) and numerous patient friends helping. We lifted loads of bricks up seven flights of stairs, built a pizza oven on the roof with Terry the oven expert and started asking to people to come eat with us. Fast forward four years and between the two companies, there's a fair few restaurants, pop ups, events and all sorts of other 'grown up' stuff. Later this year, Forza Win will be opening a second restaurant, and before we do, we wanted to have one last blast with our pals the Pizza Pilgrims. SO, for the month of April (well, beginnning 31st March) we'll be doing something of a 'throwback' to the original Forza. Thursday, Friday, Saturday and Sunday you'll be able to come and eat Londons best pizza, with toppings from our favourite Forza Win seasons, bookended by delicious antipasti and desserts to knock your socks off. Same price as the one in 2012, same format, and same awesome times."